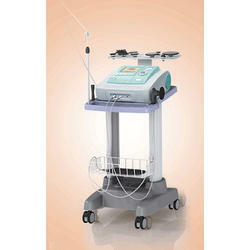 Our range of products include lavatron 250w rf diathermy device. Lavatron 250 W RF Diathermy Device helps increase the temperature of deep dermis hypodermis with 3-5cm in depth, improving cellular function, circulation of blood, relief of pain, and enhances the extension of collagen tissues. Lavatron facilitates the cure of chronic inflammations by using induction heating which refers to a method where high-frequency current applied to a body triggers resistance to convert an electric energy into a thermal energy. Automatically recognizing electrodes: Since the size of electrodes connected to the main body is automatically recognized to control the current, against such injuries as a bum that could happen due to carelessness in using can be prevented in advance Automatically controlling the temperature: By using a built-in sensor to automatically control how much current will be conveyed, a user can more safely and conveniently use the product, since the lead electrode measures a change in the temperature of body skin on a real-time basis with comparison of a set temperature 37-47 Degree C.Excellent Insulation of lead electrodes: Since there is no spark resulting from a conveyed current by perfectly insulated lead electrodes, patients will have no discomfort for the Lavatron operation. Self control of output power: Such a burn as could arise from carelessness can be prevented in advance by displaying the temperature of skin upon its contact with the lead electrode on the screen to self control and maintain the temperature set in advance. Maximized effect can be guaranteed.Impedance Monitoring: A measuremnt of impedance variations shown depending on the location or contact area of patient plate, or a patients physical constribution under auto mode aims at the most optimal output for such impedance to maximize the effect of using the product.Monitoring a change in temperature: Under auto mode, temperature changte are monitored in accordance with skin contact per second. Real time temperature is monitored. Output power is automatically controlled to reach to the target temperature in a short time and then maintain target temperature.Temperature monitoring: Since the built in sensor on the surface of lead electordes is used to measure and display the temperature of skin upon contract, a user can manually adjust the output power.Automatic operation stopped by timer Setting: Upon the operation time reach to the pre-set time limits, Lavatron automatically stops to Avoid its unnecessary uses. And also user can stop or start it anytime while using.Variety of applications: Using various size electrode from 20mm to 100mm. Lavatron can be usable for various applications.